Read my full review on ParomantasyThis series just keeps getting better! If you love Magic, Mayhem, Romance and Danger, then this series is for you.I have been a fan ever since book 1, Illicit Magic, was sent to me by Camilla and she has yet to disappoint me. Picking up a book from the series feels like getting reacquainted with old friends and I find myself fully invested in the characters, especially Stella.Stella has grown so much as a witch coming into her powers and as a woman who is learning what she wants and how to get it. She has conquered the Brotherhood, an organization looking to eradicate all witches. She has defeated a deranged power hungry witch who also wanted to kill her and her friends. She has taken on a Necromancer and showed her whose boss. But now she is about to engage in the scariest task yet...surviving the Witches Council Summit.She has a feeling that something isn't right about the Council and she is right. From the moment she gets to NY, the scary fun begins. Stella is on trial for murder, someone is murdering important witches, Stella's half-demon boyfriend has vanished and it looks like Stella and her friends are at the center of everything. Someone wants Stella out the way and will do anything to make it happen, even kill. This book is non-stop action, mystery, murder and heartache as we join Stella in the race of her life. She tries to help her wolf friends find a tailsman that may give wolves an unbeatable power that may put all witches in jeopardy while trying to to prove her innocence to the Summit before they exile her, and help her best friend stay alive as she runs for the Council and all the nominees begin to mysteriously turn up dead. Every time I thought I had everything figured out, I learned I was wrong. There are so many twists, turns and surprises that you will race through the pages of this unputdownable read!I love the development of the characters that we have come to know and love, the inside look at the Witches Council and the various mysteries that are pretty much unsolvable. The ending will both break your heart, band make you proud of the independent woman Stella has become. Of course, it also made me wish book 5 was about to be released because the suspense is killing me!This another great installment to a truly magical series! Well worth the scribd credit.I just find this series super enjoyable. I chuckle, I get annoyed.Really love this. Keeping me in my toes and not are they bent! !Very eventful to say the least! When I say my toes are bent, I'm not kidding! I can honestly say I loved every minute of it. Even the part that made me sad....well almost that part! If the next book is as exciting and eventful as this book I will bring staying up late some more. I'd like to talk more but before I realized it I would be telling you all the great parts. Read book 4 and enjoy it as much as I did. Then continue the adventure with Stella in book 5. I'm Medicare age but I think not only my age but the younger group will enjoy this series too! Alright, the first thing I want to mention is that lady on the cover is not the same Stella on the last three books covers. What happen with that? The book was good, but not better than the previous books. There was excitement through out, but no true explosive ending. I am really not an Evan fan, Gage all the way. But I am sure Evan will be the victor in the end. Loved getting to know the friends better. Hopefully all will be present in the future. Loved Micah's humor. Etoile's strength. Hopefully we will see Marc again. Would I recommend this book, yep. Can't wait for the next one. This has been the best book so far in the series. Stella just can't get out of the bit, everyone has it in for her. Going solo to save her friend from the brotherhood was a big decision and not telling anyone was a risk. once Stella arrives back in England she was in for a surprise. This journey have ore insight to her parents and family that she may or may not have, also finding out that there are many more witches in England and she wasn't one of the last few has helped Stella with her internal struggles. being invited to the summit and the election of a new leader has her confused, unfortunately not all as it seems. Georgia Thomas is out to discredit Stella and her friends bit that plan fails.The summit has also provided Stella with more knowledge of witches, demons, vampires and we're wolf's with will be useful in the next installment. as for Evan, that's on the rocks. I am.rooting for these two to have their happy ever after. this book is jammed pack, you find out more about Etoile, there's the secret talisman that the werewolf want and Evans father makes an appearance. looking forward to see what happens next. Stella is looking forward to visiting her friends in New York City and attending her first Witch's Summit, where a new Witch's Council will be chosen. Without any notice, Stella finds herself on trial for murder. Could it be a plot by one of the witches hoping to gain the coveted leader's seat on the Witch's Council? With Evan missing, an assassin on the loose and rising tensions among the witches and other supernaturals, Stella and her friends must come together to find who is after not only her, but the rest of the candidates. To make matters worse, an ancient talisman has the werewolves in an uproar. What was once thought as only legend has been rediscovered and Stella is must help her friend, Gage, before it's too late. More mystery continues,poisoning,threats,a secret talisman?More mystery. Evan is gone and Stella is on trial for murder. The wolves are searching for a talisman of immense power. There are threats, a mysterious poisoning among the candidates for the leader of the council.Stella is thrust in the middle of many factors. How will she get out of it all and who will be elected leader? I really like how the characters are developing and I am enjoying the story. However I am having major issues "believing" the relationship aspects of Stella's life. I think I understand the stated motivation for her decisions, it just seems unlikely and a bit forced. I really am invested and want to read the next novel ASAP. I was kinda burned by the ending this time around. I have to say, I think this is probably my favorite book of the series so far. Stella seemed to have more strength, changed a bit more, and it was nice to get to peek into the world of the witch council a bit more. Overall, a great next book in the series, and I'm glad there are still 2 more books left to read (when they come out, of course). I read this book on a transatlantic flight and once started I couldn't put it down.Like all the other Stella ones it was gripping.Great read. So far, the best of the series. Patiently tapping my foot waiting for the next book. I have enjoyed this series so far and wondering what twists and turns await. I love this series....here's to hoping its not a long wait for the next book to come out!! This fourth in the series still provided excellent reading entertainment. 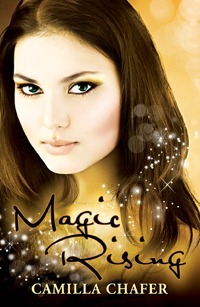 Stella's magic is getting stronger and stronger and her trials are getting harder. Camilla Chafer - Hi! I'm a USA Today bestselling author of mystery and urban fantasy novels. I'm also a freelance journalist and have written for newspapers, magazines and websites throughout the world.I live in London, UK, with my family.